Our dog recently discovered a rabbit hole in our backyard and his attention could not be diverted away from the bunnies until the last one left the nest. The rabbit hole was located along the edge of our landscaped flower beds. Mixed in between the daylillies and the weeds that have started to overtake our garden was a furry/grassy nest that the dog noticed was “wiggling”. It scared the heck out of me at first — because I was pulling weeds with my bare hands when I felt the “soft spot” in the ground and then noticed that something furry was wiggling underneath. I feared that it was a snake at first. But when I pulled back the grassy covering over the hole, I noticed several tiny bunny feet and bunny ears all crammed up together inside the rabbit hole. As soon as Tenor realized there were living, breathing creatures in there, he immediately wanted to play with them! Fortunately, I never let him put his nose directly on them, or he probably would have done exactly what our other dog did with bunnies years earlier. I’m lucky that Tenor minds me very well — usually. The minute I said “Leave it!” he would back up a few inches and just watch them. Most times when I let him outside, he would beat me to the rabbit hole and I’d have to shout “Easy!” so he wouldn’t be too aggressive when he was nosing the area — checking to make sure that the bunnies were still there. I said those words so many times over the course of several days that I’m certain those bunnies now think their names are “Leave It” and “Easy”. Anyway, no bunnies were harmed in the process of watching them grow in our backyard. Many times, in the early morning and late evening we would notice the mama rabbit hopping away from the nest, after feeding her babies. Tenor was gentle at all times, and he genuinely seemed concerned for their well-being. Each bunny left the nest one-by-one, and Tenor was sad for 2 days immediately afterwards. Here’s what you should do if you or your dog encounter wildlife — such has newborn birds or bunnies or other hurt creatures — in your own yard. The above bunnies all survived just fine. They hopped away from the den after just a few weeks in our yard. By the way, someone recently asked me how long it takes before the babies leave the nest. Each time, it doesn’t seem to take all that long. In fact, it seems much shorter than you’d think — maybe 3 or 4 weeks tops. I know that domesticated rabbits aren’t supposed to be weened earlier than 6 weeks, but things in our backyard always seem to happen much faster than that. 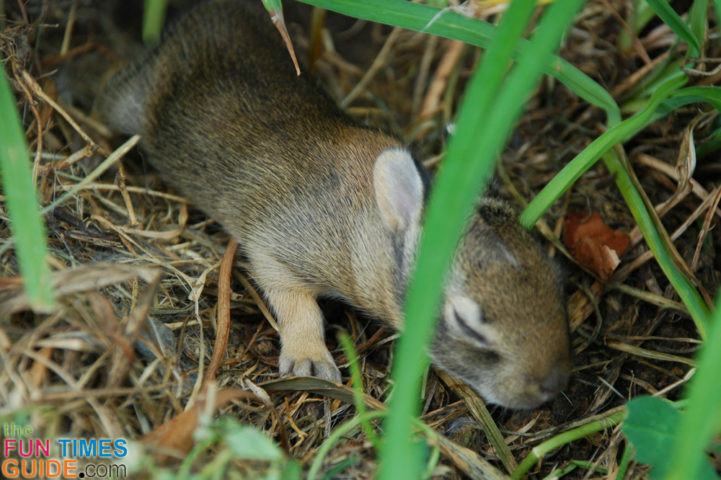 Fast forward 2 months from the day I wrote the above post and shared the above photos… and my dog recently found yet another bunny den in our backyard! It’s near where the other rabbit hole was. This time, Tenor brought a teeny tiny baby rabbit (fully enclosed in his mouth) to the back door to show me. ARGH! At first I thought it was a mouse. He gently dropped it, on command. So I immediately put the baby back into the rabbit hole. Not wanting to get any human scent on it, I used a stick to roll it into a dustpan and used that to transfer the bunny back to the den. Then I hoped for the best. I noticed that this bunny — who couldn’t be more than a day or two old — had a small scrape on its head that was bleeding ever-so-slightly. At first I thought Tenor must’ve bit too hard while picking it up, but now I’m now wondering if I actually did it myself with the weed wacker just moments before the dog ‘found’ it. After putting the baby back in the hole, I crossed my fingers that the blood and dog scent wouldn’t cause the mom to reject it or the others that are in there. I thought this new backyard attraction would mean weeks of me letting the dog out several times a day ON A LEASH (in our fenced-in backyard), but the dog is actually minding me quite well, so I don’t have to keep him on a leash after all. He’s extremely curious (and ready to pounce), but as long as I’m watching him he keeps his distance. It’s been a few days now, and the bunny with the scrape on its head is surviving just fine. All 3 are. UPDATE: Exactly 10 days after my dog discovered the newborn mouse-sized bunnies in the den, the rabbits started to leave the nest. One by one, they left the den (on the same day) as happy, healthy individuals. By dinner time, all 3 of them were gone. The mother had dutifully checked on them and fed them every single evening for the last 10 days — just as the sun started going down. The only reason I know this much detail about these little guys is because their den is right next to our deck. So it was easy to watch their growth and movements each day and night. Plus, every time I let the dog out to use the bathroom (several times a day), I had to keep an eye on him to ensure that he didn’t get too close. So I’d check and see how they were doing. I’d say they’re about gerbil size. Not as big as you might think to leave the nest, but clearly healthy. For the last few days, they were basically just huddling together (since they didn’t fit in their hole anymore) as quiet as can be, and not making a single movement whenever I or my dog got near them. Now, they are all living happily as free bunnies somewhere in the woods around our home. So I’m thrilled to report that this bunny story had a happy ending!